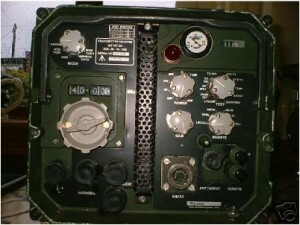 A vehicle-mounted VHF FM transceiver built by Marconi Space and Defence Systems. The frequency range was the same as the 351/352 with power settings up to 50 W. Antenna systems are provided to provide improved performance in semi-static situations such as an elevated broadband vertical dipole mounted on an 8 metre mast. The VRC is also capable of data transmission and when used in conjunction with an add-on unit (Digital Master Unit)provides a medium level secure speech network.